Rockhouse on the River will donate 10% of all proceeds for dine in or carry out to the Children’s Advocacy Center of Green River District and CASA of Henderson & Union Counties. Please join us and help support a great cause and community! Please join the Children’s Advocacy Center of Green River District and CASA of Henderson & Union Counties for an evening of painting for prevention. $10.00 from each sale will go to help our programs and services. Because we are non profit, we rely solely on grants, gifts and donations to enable us to continue to serve the children in our communities. 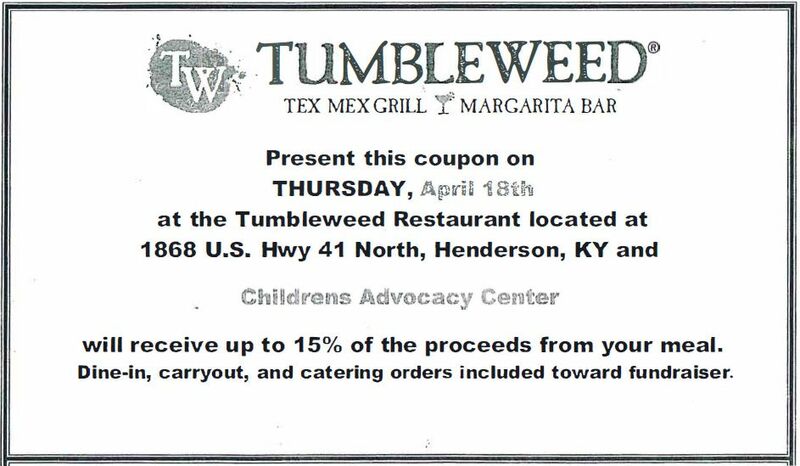 All of the proceeds of our fundraisers go directly to the Children’s Advocacy Center. Find out more about our fundraisers on our Facebook page.